Each frame is .1 seconds apart. The time for this Goodwill Game's record swim was 1:59.06 seconds. That time was ranked #2 in the world in 1998. Frame #1: The left arm enters fingers/hand first and stretched fully in front of the left shoulder. The right arm is in mid-pull approaching the end of adduction of the upper arm. The body is streamlined (flat). The right leg begins to kick. This swimmer's kick is unusual as she is a "pure two-beat kicker." Frame #2: The left hand presses down and the wrist is slightly arched. Drag turbulence can be seen coming off the back of the hand. The right arm extends at the elbow and has considerable drag turbulence trailing the hand/forearm. The shoulders and hips roll together to the left. The big right leg kick continues with some of its force contributing to the hip roll. The head looks almost directly to the bottom of the pool. Frame #3: The left hand continues to press down while flexion at the left elbow commences. The right arm has almost exited. The shoulders and hips have rolled through a similar angle. Body streamline remains good, the head looks down, and the right leg continues to kick. Frame #4: The right arm continues to bend at the elbow, an action that aligns the hand/forearm propelling surface close the swimmer's midline. Power for the right arm pull is derived from adduction of the upper arm. Shoulder-hip roll is completed and the right leg kick nears completion. The low head and good streamline positions are maintained. Frame #5: Left arm power continues to emanate from adduction at the shoulder joint with the hand/forearm and possibly upper arm surfaces providing drag force propulsion. The left leg kick is completed. Frame #6: Left arm power continues from adduction with the whole arm positioned as a propulsive surface. The right leg begins to rise as the left leg kick begins to counter-balance the vertical forces produced by the right arm that is close to entering. Frame #7: The right arm enters hand first and fully stretched forward without being "locked" straight. The left arm extends back, its force and that of the kicking left leg causing the hips and shoulders to rotate to the right. Frame #8: The right arm begins to flex at the elbow and the upper arm medially rotates to initiate an "elbow-up" position. The left arm continues to extend prior to exiting. The total body continues to roll as the head begins to rise. The left leg kicks. The drag force and its direction can be clearly seen trailing from the left leg. Frame #9: The right arm "high-elbow" position is clearly demonstrated. The upper arm, because of medial rotation, remains high as the hand/forearm is set-up as the propelling surface. The head rises and turns to breathe. The left leg kicks. Body rotation is almost complete. Frame #10: The right arm accentuation of a high-elbow position continues. Body rotation is completed while the kick nears completion. Inhalation to the left occurs. Frame #11: A very powerful adduction of the upper right arm occurs causing much drag turbulence to come from the hand/forearm. Upon completion of inhalation the head turns to look forward prior to being lowered into the water. That movement is probably timed with a particular phase of the left arm recovery action. The right leg is poised to commence kicking with the foot being clear of the water surface. Frame #12: Upper right arm adduction continues to propel the hand/forearm surface. The left arm nears entry and the right leg kicks. The streamlined left leg and the initial kicking stage of the right leg begin to roll the hips and shoulders together. The head is partly lowered into the water. Frame #13: This is a position that is slightly later than that illustrated in frame #1. The stroking cycle is repeated. 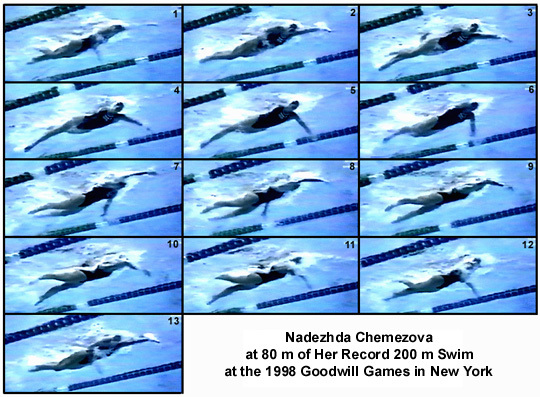 Nadezhda Chemezova's stroke exhibits a classic two-beat kicking action. To substitute for four beats the magnitude of the kick is greater than most other swimmers. It starts with the foot out of the water and finishes quite deep, well below the cross-sectional profile of the swimmer's torso. Her stroke is long but asymmetrical. The left arm pulls with the elbow-up but the right arm, while positioning the hand/forearm and possibly upper arm surfaces, does not propel through as much distance. The right elbow-up position allows propulsion to start further in front of the swimmer and positions the adductor muscles with greater stretch than occurs with the left arm. One is set to wondering if the swimmer would gain any performance improvement by attempting an elbow-up action with the left arm.